If you are in search if a rare and compelling gemstone which could serve as the crowning jewel for any collection, you will want to take a look at benitoite. Benitoite is found in a number of locations, but gem-quality specimens have only been discovered in California. For this reason, it is the state’s official gemstone. Benitoite is a very rare and beautiful dark blue gemstone. On a chemical level, it is classified as a barium titanium silicate mineral. Most benitoite deposits have been found in California, particularly in San Benito County, and in Arkansas and Japan. The gemstone’s name is of course derived from the name of the county in California. While benitoite is usually a dark, cool shade of blue (toward the indigo end of the spectrum, but still strongly blue), it may sometimes occur in white. 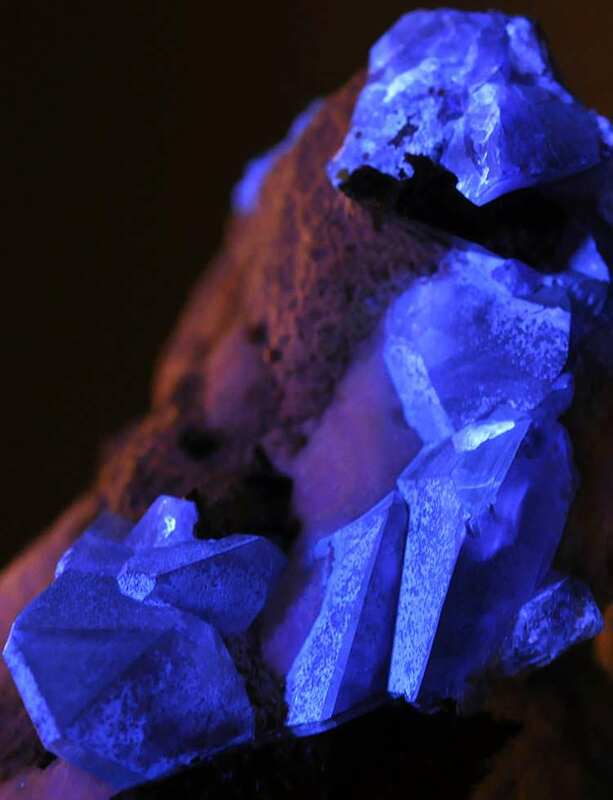 If you take a benitoite gemstone and place it under ultraviolet light, it fluoresces (a stunning example can be seen further down this page). Usually the blue specimens will fluoresce a brighter blue, or they may show up as a bluish white. If you have one of the ultra-rare white specimens, it may fluoresce a red color. Just as benitoite occurs in more than one color, with some hues being rarer than others, it also occurs in more than one crystal form. The rarest forms are 5-pointed and 6-pointed crystals, the latter being known as “Star of David.” To date, only 24 Star of David benitoite samples have been discovered and reported. Benitoite often is found alongside a number of other minerals, commonly neptunite, serpentine, albite, natrolite, and joaquinite. This may help you to search for benitoite if you are prospecting for it. There is actually a benitoite mine in California which is open to visitors; if you pay a fairly hefty fee, you are permitted to do just that. What else should you know about the physical properties of benitoite? This gemstone is typically transparent or translucent. The highest-quality pieces may actually be relatively flawless, and may easily be mistaken for sapphire. On the Mohs scale of hardness, benitoite rates a 6-6.5. For reference, quartz rates a 7, so benitoite is just slightly softer than quartz. 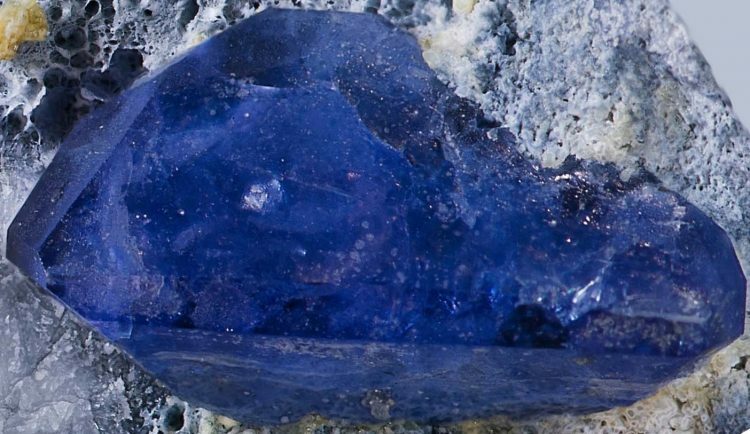 You might think that such a rare gemstone would only be collected for jewelry or display, but benitoite actually does have a use in industry. It can be used to align electron microprobe beams. The pieces required for this purpose are actually gem-quality. This only increases the value and rarity of the stone. Most benitoite however finds its way into gemstone collections. It may be displayed in its raw crystal form, which can be quite striking, or it may be cut and faceted. Benitoite is also crafted into jewelry such as pendants, earrings, and rings. As you might expect however, benitoite jewelry is quite rare and hard to come by. When you do, you will often be paying an arm and a leg for it. Most of the benitoite specimens you see for sale are loose-cut gems, not finished jewelry pieces. This makes sense when you think about it. Since benitoite is already so expensive, you might want to simply pay a little extra on top of that to get it crafted into custom jewelry. You are already making a huge investment into a unique gemstone; you would want a unique jewelry item to go with it. Or you might just want to keep the faceted stone on display in a case where it will be protected. As you might guess, factors such as color, cut, clarity, and carat all impact the value of benitoite. Color. The deep blue benitoite gemstones are prized above all others. Those that are lighter shades of blue are valued next. These are followed by pale blue benitoite gems, and finally white gems. This is worth noting since the white gems actually are rarer than the blue ones. The aesthetic appeal of the deep blue color is given more weight in establishing the value of benitoite than rarity alone. Cut. Benitoite gemstones which have been expertly cut may be faceted to showcase their clarity and color. These cut gems may be worth more than benitoite in its rare form, unless in the case of a rare Star of David crystal. Clarity. While a lot of rare and obscure gemstones which have numerous flaws and rarely make a completely flaw-free appearance, benitoite is an exception. This gemstone may appear as flawless as sapphire. As you might guess, these flawless pieces are prized above all others. Carat. The larger a benitoite gemstone is, the more it is going to cost. If you look up Google shopping results for benitoite, you will see a lot of variation in the results. You might for example find a 1.17 carat piece with a square cushion cut for $4,500—that is closely in line with the pricing reported by GemVal. But you may also find smaller pieces which are significantly less expensive. A deep blue piece with a cushion cut that weighs only 0.23 carats might go for $205 for example. Per carat, this is a lot less expensive (this could reflect lower clarity). It’s important to keep in mind that prices do not necessarily go up or down linearly with carat. There is one 5.06 carat piece of benitoite on sale right now for example which is listed as being of museum quality on eBay. The price you will pay for this beauty? $175,500. So while it is tough to find benitoite at a low price, if you shop around, you may be able to find some great deals. In particular, if you are willing to pick a piece with a lighter color or a few flaws, you may get a substantial discount. Very small benitoite gems (under a carat) are usually going to be the more affordable stones. 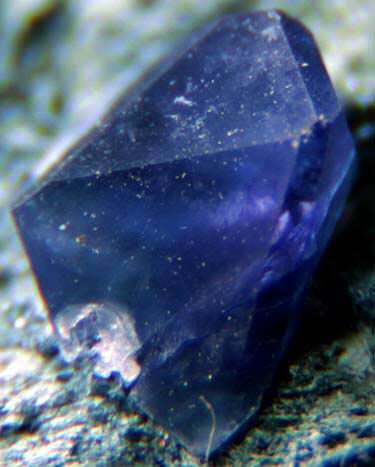 Benitoite that is used in jewelry is usually faceted. Note however that you may sometimes find polished, rounded cabochons. You also may see benitoite crystals set in their raw form. Because benitoite is a rare stone and relatively obscure as well, there is not a huge amount of demand for it among consumers shopping for jewelry. You usually cannot walk into a commercial jewelry store and find a benitoite ring or earrings. Most jewelry featuring benitoite is sold by individual artisans. This means that the items you do find for sale will usually be very unique. This is a good thing, since the craftsmanship will complement the uniqueness of the stone itself. Thinking about purchasing a benitoite engagement ring? Just as you are not going to find a lot of benitoite rings for sale at your local jewelry store, you also will not find a lot of results for “benitoite engagement ring” shopping online. Actually, you will probably call up results for sapphire and tanzanite rings. If you just search for benitoite rings, though, you will see that there are some gorgeous rings out there. They may not have been designed as engagement rings, but some of them would do nicely, especially those which include small diamonds around the central benitoite stone. Because benitoite is a very rare gemstone, it makes a rare statement as an engagement ring as well. If a diamond tells your partner that your bond is unbreakable, benitoite tells your partner that she is as unique as this beautiful gemstone. The fact that it is quite expensive (and may end up costing more than diamond) also sends a clear statement about the worth of your partner. Benitoite makes an excellent heirloom to pass down since it has substantial financial value. Benitoite’s deep blue color is spectacular to behold. Since it is often relatively flawless, it can be captivating to behold when it is faceted. If your partner likes sapphire and tanzanite but wants something more unique, benitoite may make an excellent choice. At 6-6.5 on the Mohs scale of hardness, benitoite is not as durable as a diamond or topaz, but it is less likely to break than quartz and many other gemstones. This makes it a good choice for everyday wear. Benitoite is not very traditional. Diamond engagement rings are still by far the most popular choice. For this reason, not every recipient will be happy with it as an engagement ring. You should always check in with your partner before going with any nontraditional choice. If you own a raw or faceted benitoite gemstone which is not something you got right out of the mine, then cleaning it is a simple matter, as it is with most gemstones. Do not use ultrasonic or steam cleaners. Be gentle with the stone, rinsing it with soapy water and scrubbing it carefully with a soft toothbrush if necessary. After you are done scrubbing the gemstone, rinse thorough so that no soapy residue remains. Do not use any harsh cleaning agents; a gentle dish soap is best. Then you can gently mop it dry or wait for it to air-dry. Now, if you happen to live in California and visit one of those mines where you can pay a fee to actually unearth your own specimens, cleaning benitoite is a lot more involved. Benitoite in its raw form as taken right out of the ground is coated in other minerals, particularly natrolite. 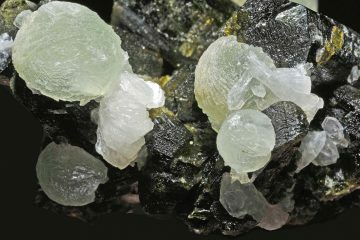 The natrolite must be removed in order to reveal the benitoite crystals. This process of removal is known as “etching” benitoite. There are a number of different supplies you will need if you want to undertake the process of etching a piece of benitoite which is still concealed inside an encasing of natrolite. You will need a few plastic bins, a pair of rubber gloves, toothbrushes, a dental pick or similar sharp instrument, a hammer, a chisel, lye, paraffin, Muriatic acid, a portable stove (like you would use if you were going camping), and artist’s brushes. In some cases, you may require a saw. 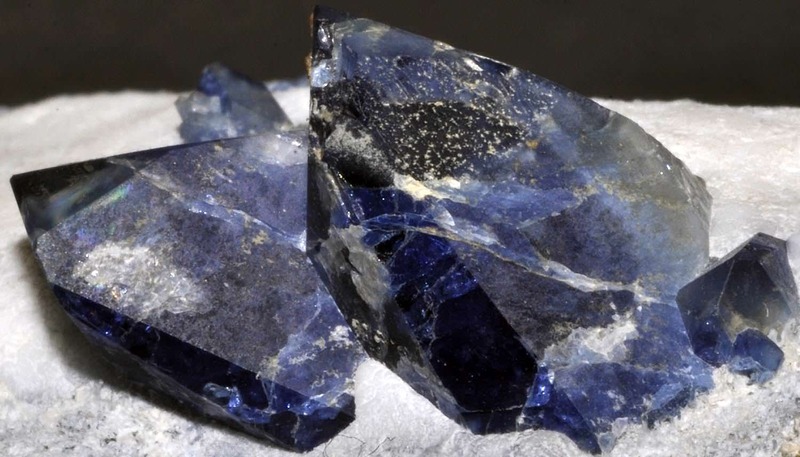 Before you can etch a piece of benitoite, you need to be able to recognize a good specimen. You will find specimens not only in mines, but also in stores run by mines both online and offline. You want a piece which is thickly coated in natrolite (that is the white substance surrounding the benitoite) which displays a lumpy consistency. Also check the edges for mineralization. Once you have a specimen to work with and you have gathered your supplies, you will be ready to etch your benitoite. Start by thoroughly washing off the benitoite. A water gun is very helpful. You probably will need to remove quite a bit of clay and mud, both of which can hang on very stubbornly. Next, put the benitoite specimen in a bin full of water. Add enough of the acid that you get a 10% concentration. Walk away for 24 hours. Dump out the water-acid mixture. Wash the specimen again using pure water. Sometimes the benitoite forms in a vein running through the middle of your stone. 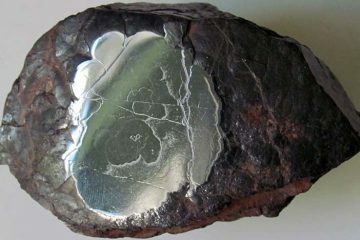 In cases like these, you need to use a saw to cut the specimen in half, preserving as much of the benitoite as you can. There are going to be areas where you want to protect the natrolite. You can preserve those areas by coating them with paraffin wax. You just melt it and then apply it using the brushes. At this point the specimen goes back in an acid bath. Try to stick with room-temperature acid, and remember to dilute your solution. More natrolite will dissolve. Repeat the process with the wax and acid as many times as you need to. Use your hammer and sharp tools along the way to shape your raw specimen. Finally, once you are satisfied with the specimen, you can take the final step of putting your specimens into a pot with a combination of water, lye, and drain cleaner. You raise it to a boil and then wait for it to cool. You rinse off the specimen one final time and wait for it to dry. This last step will remove the wax as well as any leftover acid residue. If you skip this step, that residue will gradually turn your benitoite yellow. The above is a lot of work—it can take a couple of weeks to get a single specimen finished, but it can be a very rewarding process if you are a collector! It is an incredible experience to take a mud-and-clay covered lump of rock and turn it into a dazzling display-worthy piece. If you find any benitoite crystals which are particularly flawless, you can also choose to remove them entirely and have them cut for display or for jewelry. Note that some people do use ultrasonic cleaners with benitoite, especially after they finish an etching job. But this is ultimately unnecessary and may even be a bad idea, because the crystals can break along their cleavage. When you go to all that effort, the last thing you want to do is ruin it by taking a shortcut! 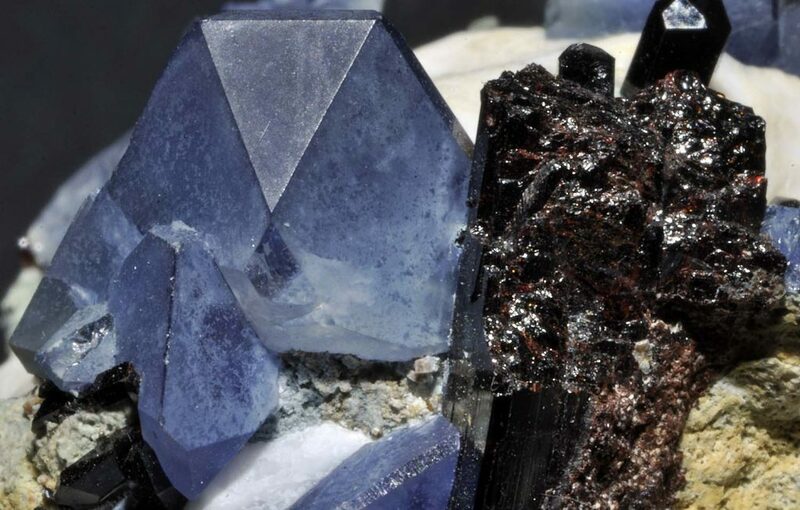 As with most gemstones, the best place to store benitoite is somewhere cool, dry, and out of direct sunlight. If you are storing jewelry, keep it in a pouch or box separate from your other pieces so that it will not be scratched. Even though benitoite is not all that soft, it is not very hard either, and other gems in your collection (even quartz) may damage the benitoite. It is also a good idea when storing raw benitoite to keep it inside a display case. Not only will this protect the stone from damage, but it will also hopefully reduce the amount of dust that settles on it. Cleaning these pieces can involve quite a bit of work, since you have to get inside all the little dips and crevices in the natrolite. Anything you can do to reduce that workload is a great idea. Take the usual precautions when you are wearing benitoite. Do not put it on in the morning until after you have applied any cosmetic products you are using; that way you will keep the chemicals away from the stone. You also should avoid wearing benitoite when you are working with your hands or you are doing anything physically active. Remember, this stone can easily fracture if you drop it or bang it against something. Benitoite was first found by J.M. Couch in 1906, who found the first specimen at the Benitoite Gem Mine located in San Benito County. Originally, Couch assumed he had struck sapphire, but when he showed it to jewelers, they realized that they were looking at something quite different. It wasn’t J.M. couch who actually identified benitoite, or any of the jewelers that originally examined the stone. It was George D. Louderback in 1907. As a professor of mineralogy at the University of California, he decided that he would name the gemstone after the county where it was unearthed. The local river that runs through the region is also known as the San Benito River. The main meaning associated with benitoite is simply the gemstone’s connection to the state of California. While there is benitoite found in a couple of other locations around the world, so far the only gem-quality specimens still are found within the state. For that reason, in 1985, it was declared as the official state gemstone. 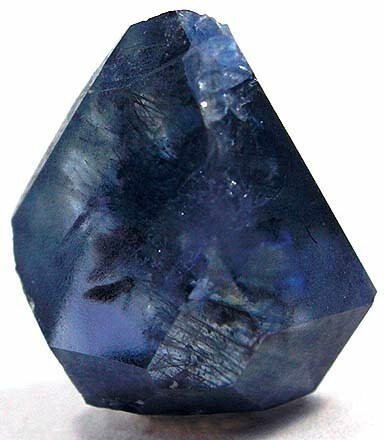 The deep violet-blue color of benitoite is readily associated with the third-eye chakra, which means that in metaphysical circles, it is linked to inner journeys. Benitoite can help you reach a higher understanding of yourself and your place in the universe. It is a good state for visions and for dreaming, like other indigo-colored gemstones. A nice video showing the gradation in color of Benitoite. Note: we are not affiliated in any way with the video creator. Sapphire: Originally, benitoite was mistaken as sapphire, and no wonder—both gemstones can exhibit remarkable clarity, and both occur in a deep, wondrous shade of blue. Sapphire however has one very pronounced difference from benitoite, and that is its hardness. Whereas benitoite rates only a 6-6.5 on the Mohs scale, sapphire ranks in at 9, making it one of the hardest gemstones around. 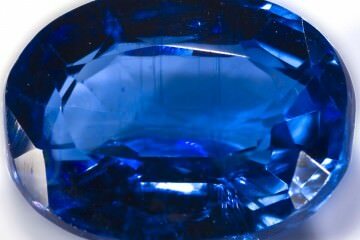 Sapphire is also usually more of a “true blue,” without traces of purple in it, whereas benitoite is closer to indigo. Neptunite: This is a silicate mineral which occurs in a very similar fashion to benitoite. Just as benitoite crystals are found embedded in natrolite, neptunite crystals are as well. Unlike benitoite however, neptunite is not blue. Instead, it occurs in black, forming a stark contrast with the snowy white of natrolite. Seen in thin fragments, there is a brownish-reddish hue to the stone. Instead of forming transparent crystals, it forms opaque crystals. It is quite brittle and only rates in at a 5-6 on the Mohs scale of hardness. Distinguishing it from benitoite is quite easy because of the color difference, but it is truly remarkable how these gemstones appear so similar in their formations. Natrolite: Natrolite is the white crystal substance in which benitoite and neptunite crystals are typically embedded. The white crystals are a tectosilicate mineral, and often have a needle-like appearance. Natrolite dissolves with ease in acid, but can be protected with wax, as described in the procedure for etching. Tanzanite: Tanzanite is a beautiful gemstone which can easily be confused in its cut and faceted form with benitoite. 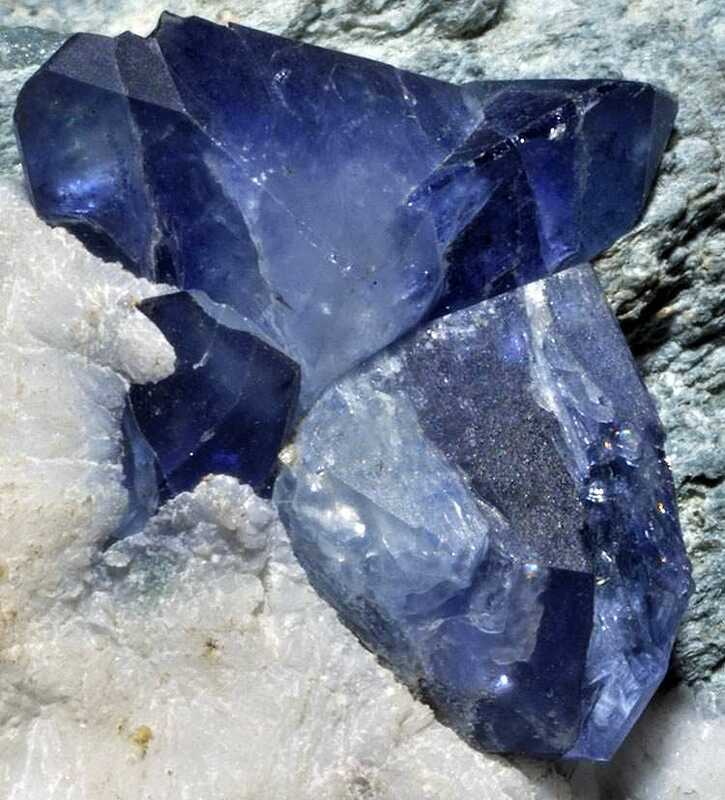 Benitoite occurs in an indigo blue color. Tanzanite occurs in both blue and violet—both hues are often present in a single stone. Like benitoite, it is rarely found in nature and is quite valuable. Its hardness is also similar, right around 6.5 on the Mohs scale. The rough form of the stone looks a good deal different, however, so it is much easier to tell these two gems apart before they are cut for jewelry. Iolite: This is the gem-quality variety of cordierite. It is yet another indigo gemstone, which in its cut and faceted form is easy to confuse with both benitoite and tanzanite. Iolite is famous because it is believed that Viking navigators in ancient times used it to help them find the sun on overcast days. In its raw form, iolite looks considerably different from benitoite. It does not form in well-shaped crystals, but in glassy lumps. 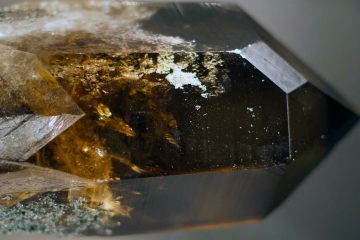 Quite often it is well-integrated with other minerals, so when you find it in nature, it looks almost like an ordinary rock. Benitoite truly is a prize for any gemstone collection. It is a stone as rare as it is beautiful. While it makes a lovely choice for jewelry, it is quite distinctive in its raw form, making a beautiful contrast against the snowy white natrolite in which it is found. While you can buy benitoite in a “finished” form, you can also purchase the specimens in their raw form as they are extracted from the mine. Undertaking a process of etching and cleaning benitoite is quite a time commitment, but the results will pay off marvelously. It is quite a magical thing to turn what looks like an ordinary clay-covered lump of rock into something beautiful!